1. The identity relation is absolute and allows for no relative identity. Absolute identity holds that for any x, x is identical to y iff all that is true of x is true of y. Relative identity is the denial of absolute identity and suggests that identity is sortal relative. 2. Four dimensionalism, the thesis that an object’s parts include its temporal parts (time-slices) is false. 3. Logic is an ideal but the use of non-standard logics in consideration of vagueness should not impinge on the general use of traditional logic. 4. Lewis’s counterpart theory about modal statements is false. 5. Material things are ultimately composed of simples, irreducible parts. 7. In terms of personal identity all mental predicates require a singular subject. These singular terms expressed in a predicative sentence apply to single reference. 8. Mereological essentialism, the thesis that wholes have their parts essentially, is false. It is possible for an object to be composed of different simples at different times and maintain its identity. 9. Ontology is not determined by convention. Conventions are not possible without some sort of grasp on an independent reality. 10. There are no conditions outside of spatial and causal relations by which parts are made into wholes. A theory about an object’s composition cannot appeal to a mental judgment but must only appeal to the candidates permissible within a three-dimensional space. If one is confronted with a stack of parts, what would one have to do in order to get them to be a whole? Van Inwagen’s answer: there is no good answer this question. If one believes that the whole is formed by the contact of the parts, have we formed a new object when two people shake hands? Suppose many people jam into a subway car. All the people are touching. Do all the touching people form a new object for the duration of the journey? Furthermore, there appears to be no way to quantify the amount of objects created through contact. If bricks are parts and the house is a whole, then there is no way to know if there are not many objects composed by the parts as well as the house. This is not to say that we are not justified in calling a house what we do, only that in theory of contact cannot tell us that there are not more objects lurking in the composition. Perhaps then there is a stronger bonding that must take place in order for parts to compose object and that that object is unique, in other words there is only one object formed. The second answer might be some kind of fastening. However, suppose two men shake hands and become paralyzed; they are unable to retract their hands and thus remain locked together, fastened. Yet surely we would not want to say that the two men have formed one new object. Even if the hands were forced to cohere so that they cannot be pulled apart without breaking their hands they surely would still not be referred to as a new object. Finally, van Inwagen considers considers the most radical form of bonding, fusion, the merging of two objects. Something fuses with another object if and only if there is no discernible seam where the two objects come into contact. However, consider: a mad scientist joins a set of children by cutting off their arms and binding them together so that there is no discernible point at which one child begins and the other ends. It seems that we would not want to consider the set of children to be one new object. There exists some y such that the x’s compose y if and only if there is only one of the x’s. Nihilism entails the view that nothing exists or, more precisely, that nothing bears properties unless it is a simple. Van Inwagen notes that this would entail that you and I do not exist and this is false. Furthermore, you and I have parts. Therefore, nihilism is false. The Proposed Answer to SCQ. Where there is a certain causal activity obtaining in a collection of simples such that we are warranted to denote it as having life, then there is an object. That object is an organism, a biological self-sustaining collection of simples causally related to each other internally. Where no such life obtains, where there is no self-sustaining organizing life principle, there is not an object but only simples arranged object-wise. What sorts of features distinguish the event of a life in distinction from other kinds of events? By life, Van Inwagen means the event of a self organizing and persisting through time. Parts are both shared and new parts are brought into the life. Van Inwagen calls this internal causation since the causal relations obtain within the complex organism. One of these self directing or self maintaining features is the feature of an intentional life. What van Inwagen needs to provide is some account of the statement “I exist.” Inwagen assumes that Descartes is right in looking for a unity of thought, a singular subject. But how is this possible if we are a collection of parts that composes organic life? While Inwagen accepts the Cartesian argument for the unity of consciousness he rejects the conclusion that the one doing the thinking is a separate substantial soul. But why think that a unity of thought requires a unity of substance such that the substance is a simple in its self such as a soul would-be? The ground of unity is just as likely to be “a dynamic storm of simples, a jealous event.” Cartesian arguments force Inwagen to concede that some organisms think. Inwagen does not believe that one has to conclude that there is a simple thinking self as the grounds for unity of thought. In contrast “the fact that I am a thinking being shows that there is at least one composite material object. But it does not explain how it is possible for there to be a composite material object. The fact that I think presupposes but does not explain the fact that certain simples compose something.… it is possible… that I might cease to think—that I might lose the very capacity forethought—and continue to exist… The fact that a certain feature of a being is of pre-eminent, even transcendent, value to that being does not even seem to show that that feature is metaphysically essential to it.” Inwagen thinks that Descartes commits a fallacy for he assumes that one is able to think of a thinking thing since it seems closer to the subject then everything else. Thoughts are right here whereas hands and feet are over there. Hasker’s objection: Hasker argues that a thinking thing cannot be composed of parts. No complex of material simples can produce thought. He believes he has this in common with Inwagen. For Hasker, this implies that if physical complex objects cannot determine any more than the properties and relations of its parts, then it is not the physical complex object that is doing the thinking. Inwagen, on the other hand, argues from the same premise that complex objects, namely human organisms, must be an exception. If Holism is false, then complex objects (organisms) cannot be determined by anything above the properties and relations of their parts. Does Hasker fall by his own sword? If a complex of simples cannot produce thought, how could it produce a soul? Here is an argument van Inwagen could make: Suppose there is a set of simples composing the brain of A. Now what simples are in or out of S is not clear (van Inwagen claims there are boundary simples that are neither in or out of S). So, it follows that there is at least one other set, S`, composed of all of S plus simple, x. If sets of simples think then it doesn’t matter about whether S or S` is doing the thinking. But what if arrangements of simples produce souls? If S and S` are sufficient for the production of a soul, then what’s to say there are not two souls present or many souls? Surely the problem of overcrowding is far more pressing on the emergent dualist than it is on van Inwagen. The emergent dualist might deny vagueness (I’m not sure what Hasker would say about vagueness) but he would have a tough job given paradoxes. An organism persists if and only if its life continues. Olson argues that this has the consequence that when an organism ceases to function, when it ceases to organize itself through a complex internal structure, it ceases to exist. If, as Inwagen argues, the complex concrete particular of the human being as an organism is dependent upon its composition conditions for life, then, if those conditions cease to obtain, then the object itself ceases to exist. Van Inwagen however argues that there is at least some part of the brain that persists as an object through time since he also believes that the resurrection of the dead entails the persistence of personal identity after death. So what does van Inwagen think about the brain he is inclined he tells us to follow in the footsteps of Daniel Dennett who proclaimed that where his brain goes he goes. The thesis of being identical to one’s brain or to referring to oneself in the first person meaning a reference to one’s brain one has to consider two thought experiments. The first considers a case in which your brain is carefully removed from your skull then placed within this goal of another body. The question in this case is: who went where? The second question concerns the gradual reduction of a body until we reach a part after which we cease to exist, call this be shaving question. Call the first problem the body Switch. According to the shaving question various body parts can be detached without impinging on the continuance of the life. Suppose one loses a finger. Should the finger be considered as part of the life? According to the Inwagen, since the finger is no longer part of the self-organizing organism it no longer counts as an object in the strict sense, it is merely a collection of simples arranged anything otherwise. Notice that this view does not entail that there was a finger as an object prior to it’s being removed. Rather, “before the finger was cut off the samples that virtually composed it were all caught up in a life, but their activities did not constitute that life… After the finger that was cut off, however, they were not caught up in a life at all.” What has been said about a finger could be said about other body parts as well. Further, consider that the removal of the head is done gradually during a speech made by the subject and that the removal of his body is done so that he has not aware that it is happening to him. Inwagen presumes that this leaves us with the conclusion that though the subject loses his body he continues to be the same person. Of course the shaving problem ultimately leads to the naked brain or the brain in a vat. The case of the brain in the vat is no different to the case of the man who has lost a finger. Though many functions are lost and in the case of the brain in that all the functions that we associate with a human being are lost there is in principle no logical difference between this shaving of body parts and the shaving of all body parts until one is left only with the brain. Consider Inwagen’s analogy of an Empire. The empire is run from the palace and the palace administrates the organization of the Empire. Then a catastrophe destroys or removes the communication and organization of Paris from the Empire. Van Inwagen claims that this would not destroy the Empire but only isolated very small remnants of the administrative staff. Van Inwagen argues that in reducing the Empire A new object is not thereby created for nothing can become a preexistent object for that would violate the principle of the transitivity of identity. Recall that van Inwagen suggests we think of the shaving problem not in terms of an object such as the finger existing either before it is severed or after. Inwagen suggests that the fact that there are no tables does not imply that he is suggesting we are somehow at fault for saying things like, “there is a table over there.” In ordinary daily life we use terms that are imprecise, vague and only pragmatically employed. In philosophy, however, we should precisify our language. Inwagen suggests that it is rather like a group of settlers who come across a black tiger and call it a bliger. At some point they discover that the bliger is really just a combination of animals and not a tiger at all. What do you think? One might respond by saying, “well, now we know that there are no bligers we can say that there are no bligers.” And what goes for the bliger goes for the table. (2) It is not the case that indeterminately (a=a) since a is identical to itself. What is Inwagen’s response? Inwagen employs a third category logic whereby some sentences are assigned a truth value neither true nor false. It is vague that p iff it is neither true or false that p. Inwagen designates sentences of this type with the truth value ½. Other options might be to employ degreed truth values. A sentence might be valued in degrees of truth (0, 0.25, 0.5, 0.75, 1). Harold Noonan notices something about Inwagen’s argument. He says that Evans’ is arguing against metaphysical vagueness and for semantic vagueness. According to Noonan, Evans’ argument works because it forces the metaphysical vagueness proponent to locate vagueness in language. What does van Inwagen do? Precisely that, says Noonan. 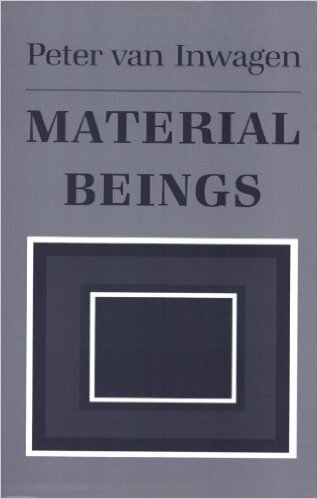 Peter van Inwagen, Material Beings (Ithaca: Cornell University Press, 1990), 18. “it follows from A and B that I existed 10 years ago and was then a biological organism. It follows from C that 10 years ago that organism—I—was composed of certain atoms. Let us use T as an abbreviation for’ the atoms that composed me 10 years ago’. By D, all of T still exist. Now assume that universalism is true. Then T now compose something. Call it’ the thing that is at present the sum of T’ or’+T’. from universalism and F it follows that T composed Plus T 10 years ago. But, By definition, T composed me 10 years ago. Therefore, by F, I was plus T 10 years ago. But then IM plus tea now. If 10 years ago a certain object and I were such that there Was only one of us, then there is only one of us still: anything and itself cannot go their separate ways. But I am not now plus T at present, Plus T, if it exists at all, is (I would suppose) a rarefied spherical shell of atoms, About 8000 miles in diameter and a few miles; in any case, Plus T is now composed of atoms none of which are now parts of me. Our assumption of universalism has, therefore, led us to a falsehood, and universalism must be rejected.” Ibid., 78. Micheal Rea, “In Defense of Universalism” in Philosophy and Phenomological Research, Vol. 58, No. 2 (June, 1998), 349. William Hasker, The Emergent Self (Ithaca: Cornell University Press, 1999), 140–144. This is essentially the argument Igor Gasparov makes against Dean Zimmerman’s view in Igor Gasparov, “Emergent Dualism and the Challenge of Vagueness,” in Faith and Philosophy Vol. 32 No. 4 (October 2015), 434. Eric Olson, What Are We? (New York: OUP, 2007). See Elizabeth Barnes, “Vagueness” in The Routledge Companion to Metaphysics, eds. Poidevin, Simons, McGonigal Cameron (New York: Routledge, 2012. For example, see Graham Priest, Logic (New York: Sterling, 2000), 93–103.